With wildfires raging, shorelines receding and water supplies declining in much of California, Oregon and Washington this past summer, residents of the West Coast are experiencing many problems related to an historic drought that has overtaken this region of the country. In an effort to tackle these issues, the University of Oregon’s Environmental and Natural Resources Law Center, the Journal of Environmental Law and Policy and the Oregon Review of International Law are hosting a day-long symposium. 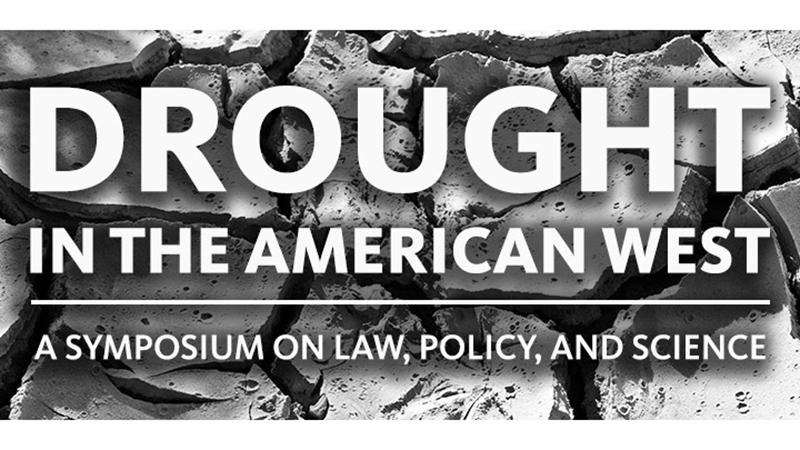 “Drought in the American West: A Symposium on Law, Policy and Science” will take place at the UO Knight Law Center from 8:30 a.m. to 5:30 p.m. Friday, Sept. 25. The interdisciplinary symposium brings together lawyers, scientists, professors, government officials and water resource experts from across the country in a shared effort to explore the reasons, consequences and possible solutions to the drought. The environmental law center has tailored the event to audiences from both urban and rural areas, as the drought has a measured effect on the daily lives of almost all Oregonians — and more broadly, all residents of the West Coast. The symposium will explore a wide range of drought-related topics through panel discussions — from urban water use to the implications of water supply scarcity on agriculture to the relationship between water availability and energy production. The prospect of the drought’s consequences being the “new normal” has prompted those within the research and academic fields to work closely with policymakers to try to find solutions and ways to adjust to these conditions. State Sen. Floyd Prozanski is scheduled to deliver opening remarks at the event, followed by Lauri Aunan of Gov. Kate Brown’s office, who will discuss the state’s current reactions and future preventative measures. For a complete schedule and list of speakers at the symposium, click here. While participants can register in person a half hour before the scheduled start time, pre-registering online is recommended because space is limited.